We gave Darkside ($1.99) a quick look early last week and were quite pleased with our initial experiences. After giving the game a run through its paces, it’s obvious that beauty in this arcade dual-stick shooter is far more than simply skin-deep. An excellent implementation of a classic arcade genre, extremely fair shareware model, and of course amazing visuals should leave iOS gamers with very little reason not to check out this gem. 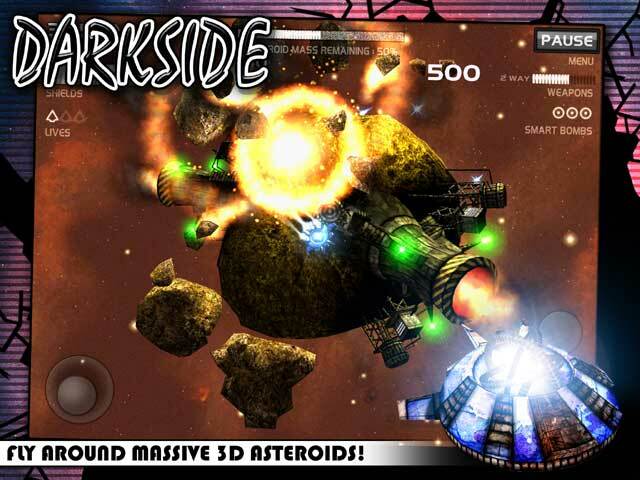 At its core, Darkside pays homage to the roots of the dual-stick shooter and charges you with the always indomitable task of ridding the galaxy of asteroids. Sure, you’ll encounter a variety of enemy ships that will try to take you out, but the asteroids are typically your primary target. Aiding you in your quest is a wide variety of power-ups, such as weapon boosters, shield rechargers, and points. Darkside also borrows from newer members of the genre with its pseudo-3D planetoid environments a la Super Stardust HD. While Darkside features a mission-based mode with a variety of objectives, most folks will stick with the Arcade or Survival modes, which are purely races to see who can get the highest score. Game Center leaderboard support is also in play and works well enough (if you ignore the obvious hackers). From a gameplay perspective, Darkside isn’t going to make waves in terms of innovation, but there are plenty of other areas where the game shines. For a game with such a simple premise, Darkside does a great job with presentation and ambience. The music and general color scheme convey a subtle dark tone. The camera angle puts you in a position of knowing most of the asteroids and enemies, but it still leaves an unknown variable that heightens the tension. Since most arcade games typically lack any type of serious narrative, it’s important for the gameplay to have feeling, and I think Darkside hits that mark. However, I’m most impressed with just how well it implements the details. A discreet HUD hangs around the edge of the planet, showing you where all the enemy ships and asteroids are. When you pick up special weapons, you can see exactly what type you’re wielding and how much of the ammo you have left. Even the virtual controls are positioned in such a way to minimize your thumbs getting in the way of the action. Sure, these are all small features, but they’re almost always either overlooked or hastily (i.e. poorly) implemented. However, they all work in Darkside, which goes to show just how much care the developers put towards this game. Special mention should be made of the game’s visuals which are, quite simply, awesome. 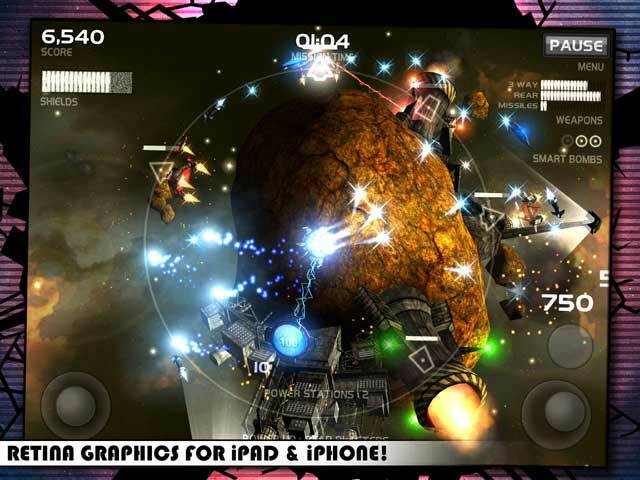 Each planet is highly detailed and every weapon and explosion is a dazzling treat of lighting and particle effects. While Darkside looks great on iPhones, I’m doubly impressed at just how good it looks on a retina-display iPad. Thankfully, a mostly stable framerate accompanies the graphics, which is essential for a fast-paced arcade title. Admittedly, players can get inundated with special effects at later levels making the map somewhat hard to navigate, but the eye candy is impressive. If you still aren’t convinced, you can play Darkside’s Arcade mode for free with Mission and Survival modes unlocked via a one-time 99¢ IAP (the smart bomb power-up also unlocks with the purchase). There are no other in-game shops, freemium gimmicks, or anything of the like. I would have unequivocally recommended Darkside if it cost any reasonable amount. However, considering you can download it for free, you have no excuse not to check out this most excellent arcade shooter.